His cheery Sun Glitters alias and beachy pastel album art cover up a pretty eerie darkness in Victor Ferreira's music. Promises of loveliness by track titles like "The Wind Caresses Her Hair" are always undercut by garbled vocal samples and the producer's fondness for percussion that sounds like ant colonies trampling dead leaves. All of which sets up West Palm Beach, Florida duo Sumsun’s remix of "They Don't Want to Let You Know" to be probably the happiest Sun Glitters song ever, a carefree Saturday excursion into bongo-driven palm tree gazing that opens, for once, with sounds that actually sound like glitter. 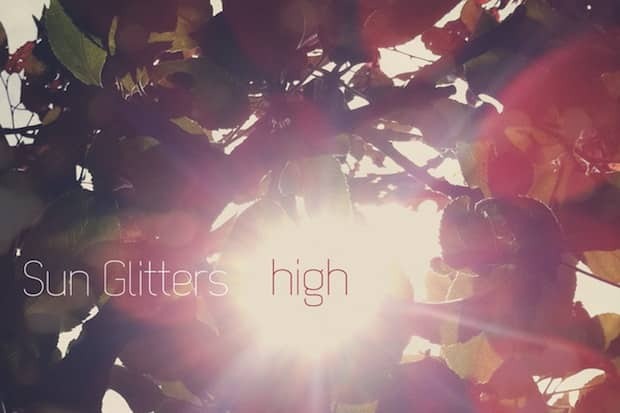 The Sumsun remix comes from Sun Glitters latest EP, High, featuring some of Ferreira's most original and heartstring-gripping production to date. The EP comes out next week via Music Is for Losers (preorder here). Earlier, Sun Glitters shared its second track, "It Takes Me," which is also streaming below. Download: Sun Glitters, "They Don't Want to Let You Know (Sumsun Remix)"
Stream: Sun Glitters,"It Takes Me"